The Trojan War was the greatest catastrophe of the ancient world. We are told that it devastated Europe and Asia and plunged the known world into a Dark Age that lasted 500 years. This is the ‘Story of Troy’. The truth has never been established – until now! 30 years of painstaking investigative research has finally resolved this 3,000 year-old mystery. Author and Historian, Bernard Jones, uncovers the evidence piece by piece, separating fact from fiction, and unlocking for us the secrets of the past. Unbelievably, Bernard’s research showed that the Trojan War could not have taken place in the Aegean area, or even in the Mediterranean world. This evidence turns our accepted geography on its head and leads us on a fascinating journey of discovery back to the real world in which the Trojans lived. Here, we discover who the Greeks and the Trojans really were, and the parts they played in Homer’s Bronze Age world. Secret knowledge concealed in the Iliad reveals Homer’s work to be a genuine historical record. Yet, only in the corrected Bronze Age environment can it be understood. Deciphering Homer’s coded information becomes the key to finding the location of the Trojan War and the Bronze Age city of Troy itself. Lost histories also tell the whole story of the migrations that took place following the Trojan War and the nations that arose out of the ashes of Troy. The records of these nations independently verify the author’s findings, and they overturn the theory of a ‘Dark Age’. Mylee in the Mirror explores young romance and school drama with an infusion of Greek Mythology. What were some themes you wanted to continue from your first book and what were some new ideas you wanted to explore? Well, in Daisy, Bold & Beautiful I wanted to create a situation for my main character that would demonstrate the same moral of the story that I find within Persephone’s story – it is important to stand up for yourself. The story in Mylee In The Mirror is very different, but I arrived at it in the same manner – I wanted a story that would demonstrate the moral of the story I find in Aphrodite’s story – you can’t force someone to love someone else. I hope to do that with all the books in this series – decide on a moral of the story for each god/goddess featured in the book and create a story that demonstrates that moral. I enjoyed Ty and My’s characters and interactions. What was the inspiration for their relationship? Hmmm… well, I didn’t really have a specific relationship in mind when I was writing it. I developed each character (for instance, Ty is loose combination of my [real life] Trampoline & Tumbling teammate, Ty, my dad, and my brother, Will), then had them interact the way I imagined those characters would interact with each other. I have a friend, Peter, who I joke around with, kinda like Mylee and Ty joked around together, but My & Ty were friends longer than Pete and I have been and they’re closer than Pete and I are. How has your writing developed and changed from book one in your Greek Mythology Fantasy Series? I don’t know exactly how my writing developed and changed from Daisy to Mylee, but this book was really different to write because Daisy was all about 6th graders and I was a 6th grader when I was writing it, so I could really relate to what they were doing and how they were acting. Mylee is about ninth graders AND Ty was my first male main character. Obviously, I don’t know anything about being a boy, and certainly not a 9th grade boy, so I had to talk with my brother quite a bit to decide what Ty would do and how he would act. I also talked quite a bit with my mom about the two moms in the story and Grammy Jean. Grammy Jean was based on my real-life great grandmother, who passed away last winter. The character wasn’t exactly like my Grammy Jean, but pretty close. So, I guess I can say I worked more and worked harder this time trying to understand motivations to make the characters feel really real, know what I mean? What are you currently writing and when will it be published? Freshman year is just starting, and already Mylee fears her family is falling apart. She’s not interested in dating or any of the high-school drama it brings, but that’s just what she gets when Sam, the most popular guy at school, invites her to the Homecoming dance. Mylee needs advice, so she summons Aphrodite, Goddess of Love and Beauty, her secret confidant. Tyler is worried about Mylee, his best friend and teammate. Already sad about her family woes, he’s livid that Slimeball Sam is trying to ooze his way into her life. And she seems to be falling for Sam’s act! Worse, Ty is worried all this attention from such a popular guy will place Mylee officially out of his league. What does an ancient Greek goddess know about modern teenage romance? Can My and Ty save their friendship and discover what matters most? A genesis is a beginning: a source, a founding moment. 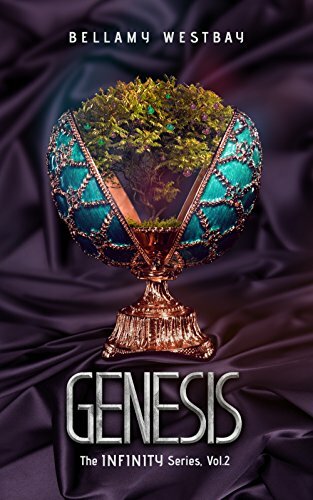 Though Bellamy Westbay’s Genesis is the second volume in the Infinity Series, readers will have no doubt that this tome marks a beginning. The odyssey opens with the beguiling Gwen in grave danger. Though angel Alex is the only being, mortal or celestial, who can ultimately save her, the antidote for her current troubles comes from a source seemingly bent on her demise. Follow Alex, Gwen, and Jasper on an epic journey through a bewitching multiverse, one haunted by evil forces, fantastical creatures, and a series of confounding quests. In this odyssey of good versus evil, of human nature and the divine, Westbay tackles love, lust, and redemption. She also explores motivations more primal: eternal enmity, darkest jealousy, and destructive cunning. Westbay’s storytelling moves at a heady pace, switching between the questing trio and Gwen’s best friend, facing her own predicament. The book is surprisingly sparse in some places—a run-in with an eloquent dragon comes to mind—but delves deeper in others, offering vibrant descriptions of other universes and their inhabitants, including ethereal Callidora and Eva with her siren song. Vivid details aside, the plot is the star of this show and Westbay moves it forward with skill. And what an intriguing plot it is. Genesis operates where divine beings move among mere mortals. At first I struggled with a Cinnabon-eating angel but I was quickly won over by Alex’s supernatural powers, very human weaknesses, and impressive wingspan. He is simultaneously angsty and arch. For a celestial being and polyglot to boot, he can be frustratingly obtuse: he knows little of human nature and often his epiphanies land with a thud. Even so, he captivates readers as the boulder-smashing, beast-slaying hero of our story. If Alex is Odysseus on an epic journey and Eva a Siren, Gwen is Helen of Troy. Though not exactly “the face that launched a thousand ships”, Gwen is certainly the being that launched a thousand cherubic fantasies. The amorous undertones in Genesis know no bounds: whilst Gwen clings to life, both the misguided Jasper and the ardent Alex lust after her. Readers feel relief when Gwen revives and apprehension as death draws near. This epic journey is exhilarating and well-told. Westbay is a true storyteller with a gift for weaving familiar themes into a fascinating new world. Mylee is experiencing one of the most trying times in her young life. Not only is she watching solemnly as her parents’ marriage hits its rockiest stretch to date, she is unable to convince her mother that she is happier and more productive not being a cheerleader. To top it off, Mylee should be having the time of her life as she seems to have caught the eye of the school’s most desired boy–real homecoming king material. Mylee just can’t seem to catch a break. When her beloved Grammy, her confidante, moves into a new apartment farther from Mylee’s home, the struggle becomes even more real. 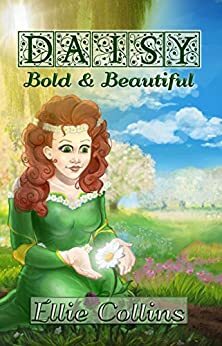 Ellie Collins’s second book in her Greek mythology series, Mylee in the Mirror, is a fantastic follow up to her first, Daisy Bold and Beautiful. This young adult fiction series is shaping up to be an artfully designed set of books with well-developed characters and engrossing plot lines. Collins is a master at incorporating current teen culture and dialogue. 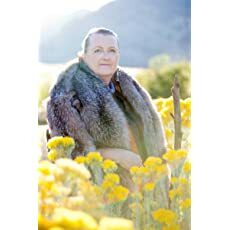 Her writing flows smoothly, and her characters seems to jump off the page–especially her main characters. Mylee and Ty are an adorable pair and their friendship leaves the reader rooting for them from their very first interaction. Collins seems to have a knack for drawing a thoroughly detestable antagonist. Sam is clearly sketched as the villain, and the dialogue she has given him keeps readers focused on exactly how wonderful Ty is for Mylee–writing perfection. Collins manages to tap into complex relationships quite easily whether it be the parent-child relationship or the ever-evolving relationships between teen friends. She pinpoints the drama that so easily arises between girls over potential love interests while at the same time highlighting how easily true friends are able to see the wolf in sheep’s clothing. I am, again, intrigued by Collin’s use of Greek mythology in her plots. She pulls the story of her grandmother’s mirror and the tale of Aphrodite almost effortlessly into what, otherwise, reads as young adult fiction. The fact that Mylee is able to keep her experiences to herself and use what she learns from her encounters with the mirror is a truly unique approach in this genre. Collins is an author to be watched in the coming years. The ease with which the words flow from her mind to the paper is to be envied indeed. Her writing is phenomenally engaging, and I look forward to seeing more from her series in the future. I highly recommend her writing to any parent of young teens looking to engage their children in well-written and timely books. Evan is a normal twenty-first century man who works as an architect. However, to interrupt his daily routine, none other than Zeus himself, has decided to transport Evan to the sixth century BCE. Evan now travels across ancient Greece with his companions, including Atlanteans, a high priestess, and his friend, Dexion, who has the power to see into the future. All of this is for a mighty cause, Evan has been chosen by Zeus to unite two powerful relics in order to save the Gods from extinction. Stuck in the sixth century BCE Evan longs to return home. Given his precarious position between times, the juxtaposition of his wants against his reality serves to highlight the stark differences between the comfort of home that Evan is used to and what he is currently facing. For instance, walking across a sandy plain in sandals verses the want for a motorbike to make short work of the distance. His modern life’s influence over his worldview often leaves him homesick, but he must complete his mission. On the other hand, his life back home gives him ways to solve the problems he faces in the sixth century BCE, taking ideas from the pop-culture of his own time and bringing them into the past to aid his quest. This fusion of time periods makes for some brilliant innovations and cross-overs between what we as the reader understand to be ancient Greece, and the modern day. The Labyrinthine Journey is book two in Luciana Cavallaro’s Servant of the Gods series and it follows on fluently with the events of the previous book with references here and there to book one. Something striking about the series is the relationship between mortals and Gods. With whole chapters dedicated to the musings of God’s and their society it gives the reader an insight into their intentions. Furthermore, the book proposes an alternative viewpoint on the beginnings of Christendom. The Greek Gods fear that they will lose their dominance in light of a God-sent child being born that will potentially lead to the widespread belief in a single God instead of the current pantheon. This retelling of the birth of Christ from the God’s perspective explains why Zeus wants the relics united – to maintain his and the other Gods’ significance. However, there are some Gods trying to interfere with the mission and stop Evan’s and his companions’ journey. Evan searches ancient Greece, already in possession of the first relic, for the second to unite the two. The perilous journey over a treacherous landscape naturally reminds one of the epics of Homer. 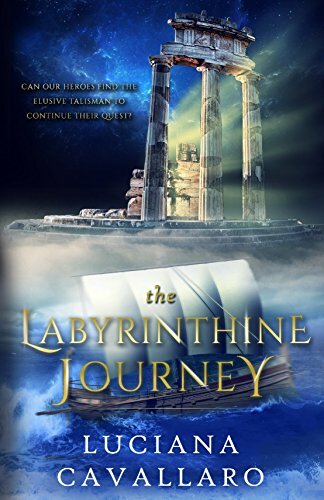 The Labyrinthine Journey was a thoroughly enjoyable read. I give it five out of five for its sophisticated and inventive retelling of the well-known and widespread story of Christ and its ability to connect it to the overarching quest narrative seamlessly. Luciana Cavallaro’s prose fits the story perfectly, making the journey truly epic. Furthermore, the fusion of God’s, monsters, ancient philosophers, magical ancient relics and even time travel, leads to unexpected twists and turns throughout the novel. Daisy, Bold & Beautiful follows young Daisy as she struggles to fit in at school and finds help from an unlikely friend. What was your inspiration for this story? Well, Persephone is my favorite Greek goddess, so I knew I wanted a story featuring her. And, to me, Persephone’s story is all about standing up for yourself. I wanted the moral of my story to match the moral of Persephone’s story, so I came up with D.J. I didn’t want it to be mistaken for a book about bullying, though, so I wanted to put D.J. in a situation where she needed to stand up for herself, but not because she was going up against a “bad guy”. There is a unique infusion of Greek mythology in this book. Why did you want to use that theme throughout the book? Like I said, I knew I wanted to write books about the Greek gods, because…come on…they’re AWESOME! I didn’t want my books to feel like historical stories, though, so I came up with a way to bring up the stories of the Greek gods while actually writing about kids living today. I liked Daisy’s character, and I felt she was relatable. Did you plan her character before writing or did she develop organically while writing? So, the first thing I did was come up with a god to write about: Persephone. Then I wrote an outline to the story. THEN I wrote up character descriptions for all the characters. A lot of my characters share names with people I know in my real life. Some of the character personalities match those of the people they’re named after and some are different than the real people. D.J. wasn’t named after anybody I know; she’s just made up. I would say all the characters developed a little more as I wrote the story, but they all started off with pretty detailed character descriptions. That was actually the hardest part of writing the book – coming up with the back story and personalities for everyone. I tried to include at least one fact about each character that the readers never find out – just to try to make them really real, know what I mean? Funny that you should ask that! 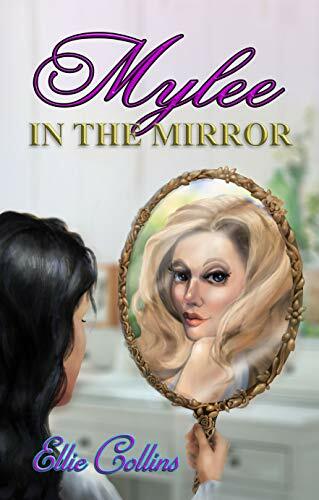 The second book in the series is Mylee In The Mirror, and it’s available AS OF TODAY! This book is about Aphrodite. I’m really excited about this book because it has TWO main characters, Mylee and one of her best friends and teammates, Ty (Tyson). I was nervous about writing about older kids (the main characters are in the ninth grade, and I’ve obviously never been in the ninth grade before – it was easier with Daisy, Bold & Beautiful, because I was the same age as D.J. when I wrote it). I was also nervous about writing from the perspective of a guy, but writing about Ty was super fun and I might even make my next main character a guy! D.J. and her dad moved far from the small town and only home she ever knew. Now she’s starting middle school in the city with kids she’s never met. She tries to make friends, but they all appear to be slaves to screen time. D.J. just likes to garden, nurturing plants, watching them grow and thrive. It seems she’ll never find a way to fit in, but then she awakens in a gorgeous garden where she meets Persephone, Goddess of Spring. She must be dreaming; her new friend can’t possibly be real—and what could she know about getting along with gamers? D.J. really needs some ideas, or she might never find her own place in a complicated world. Daisy, Bold & Beautiful is the debut novel of middle-schooler Ellie Collins, daughter of award-winning author Stephanie Collins. Boys and girls alike will appreciate Ellie’s keen eye for the challenges of growing up that she and her friends must face. Discover the wonderful writing of Ellie now, then follow her to learn about her writing and more books to come. Dagger’s Destiny follows princess Catrin who is torn between duty to her kingdom and her forbidden love. What were some things you felt you had to bring over from Apollo’s Raven and what were some new themes you wanted to explore? One of the themes I carry over from Apollo’s Raven is Catrin is torn between her duty to her kingdom and her forbidden love for the Roman enemy, Marcellus. 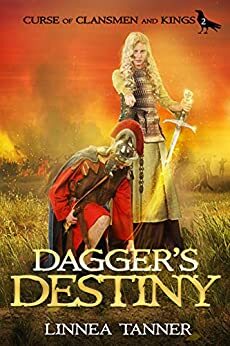 However, in Dagger’s Destiny, Catrin must face the consequences of her forbidden love when her father, King Amren, accuses her of treason due to her liaison with Marcellus. Duty is of greatest importance to the characters because it exemplifies the honor central to being in a position of power. Duty to the state and the family’s legacy is explored as well as duty to loved ones and to one’s self. The characterizations of Catrin, Marcellus, and their fathers are more fully explored as each person must grapple with balancing their duty to the state vs. their love to those they cherish. There are no easy resolutions as the fathers have resorted to brutality and corruption to maintain their powers. Another theme that is explored in Dagger’s Destiny is fate vs. free will. Catrin must dive into the Depth of Possibilities of what choices she can make to stop the curse that foretells her half-brother will kill their father. However, whenever Catrin changes the future, the curse an alter in unexpected ways. Dagger’s Destiny is a genre-crossing novel with elements of a romance, fantasy and history as well. Did you start writing with this in mind, or did this happen organically as you were writing? When I first start writing the series, the story was intended to be a historical fiction based on the legacy of Mark Antony and Cleopatra, but with a Celtic twist. However, as I explored Celtic and Roman mythology, I began weaving in some of the fantastical elements to help explain what the Celts believed. I was particularly fascinated to learn that the Celts has a similar belief in the immortality of the soul as the Greek philosopher, Pythagoras. They believed the soul could transmigrate between different animal species and could occupy another body after death. As a result, the series evolved into a more mythical tale as I weaved in other fantastical worlds and druidic powers into the historical backdrop. A secondary character that I enjoyed developing was Ferrex—a loyal, duty-bound Celtic warrior who deeply loves Catrin and risks his reputation to support her. Down-to-earth and blunt, Ferrex is a sharp contrast to Marcellus, a suave and impetuous Roman nobleman who has had a reckless affair with an older married woman. Ferrex will continue to play an important role in the series. This is book 2 in your Curse of Clansmen and Kings series. Where will book 3 take readers and when will it be available? Book 3: Amulet’s Rapture will take the star-crossed lovers, Catrin and Marcellus, to Gaul (modern-day France) and Rome. Even thought they believe they are destined to be with each other, they encounter resistance to their love at every turn. They will sacrifice almost everything to be together, but can Catrin must balance her fate to retake her kingdom as a warrior queen with her role as the lover of a man who considers her subservient? Amulet’s Rapture is drafted and undergoing revisions based on feedback from critique partners and an editor. It is my goal that it will be published in approximately one year. In the rich and vibrant tale, Author Linnea Tanner continues the story of Catrin and Marcellus that began with the awarding-winning novel APOLLO’S RAVEN in the Curse of Clansmen and Kings Series. Book 2: DAGGER’S DESTINY sweeps you into an epic tale of forbidden love, mythological adventure, and political intrigue in Ancient Rome and Britannia. War looms over 24 AD Britannia where rival tribal rulers fight each other for power and the Romans threaten to invade to settle their political differences. King Amren accuses his daughter, Catrin, of treason for aiding the Roman enemy and her lover, Marcellus. The ultimate punishment is death unless she can redeem herself. She must prove loyalty to her father by forsaking Marcellus and defending their kingdom—even to the death. Forged into a warrior, she must overcome tribulations and make the right decisions on her quest to break the curse that foretells her banished half-brother and the Roman Empire will destroy their kingdom. Yet, when Catrin again reunites with Marcellus, she is torn between her love for him and duty to King Amren. She must ultimately face her greatest challenger who could destroy her life, freedom, and humanity. Will Catrin finally break the ancient prophecy that looms over her kingdom? Will she abandon her forbidden love for Marcellus to win back her father’s trust and love? Can King Amren balance his brutality to maintain power with the love he feels for Catrin? Daisy Jane, affectionately known as D.J. by family and friends, has experienced great loss and faces the challenge of attending a new school. With the support of her loving father, D.J. heads into the daunting situation with strength and a resolve to make friends and succeed academically. D.J. has another source of strength–her fern. Unlike many girls her age, D.J. opts for outdoor activities instead of games, stuffed animals, and make-up. Having inherited her mother’s love and great skills for gardening, D.J. strives to introduce her new friends to her interests as she learns from a unique acquaintance of her own that friendships involve compromise. 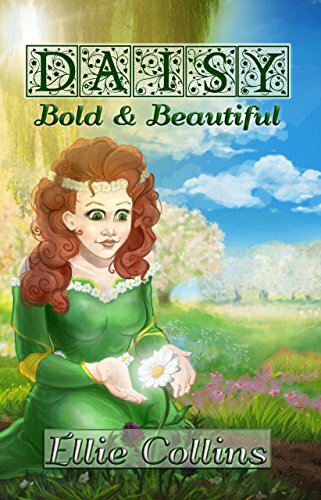 Ellie Collins book, Daisy, Bold and Beautiful, is a highly engaging tale woven with bits of mythology. 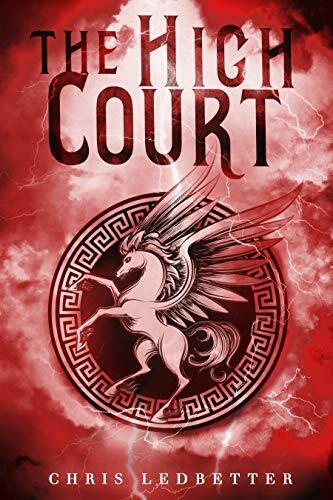 Collins has managed to take some of the more complex elements of Greek mythology and finesse them into verbiage that is relatable and entertaining for tween readers. Most middle school students would not choose to read about gods and goddesses in the formats with which we are all familiar. Collins is providing her readers with a sure-fire hit that will involve readers, teach them the basic outline of the story of Persephone and Hades, and never let them realize how much they are learning. That, my friends, is the true hallmark of a successful writer. Collins hits the mark with her dialogue, her main character’s emotions, and the dynamic between two very different friend groups. Young readers will be able to find themselves easily in one or more of the characters. The mere mention of popular video game titles is a huge draw for gaming fans, but Collins is thorough with descriptions, the exchanges between the characters as they excitedly discuss scenarios, and the way they are wrapped in the world of the game itself to the exclusion of all else. The author, without a doubt, knows her stuff. As I read, I became increasingly amazed at Collins’s stunning ability to pull out the most relevant parts of Persephone’s story and meld them into modern day scenarios. Nowhere else have I read such perfectly revamped story lines. It takes quite the imagination and a firm grip on the mentality of today’s youth to manage a task like this. If I am being completely honest, I have to say I learned a great deal myself regarding Hades and Persephone’s relationship. Collins nails it. I would not hesitate to read this story to and with fifth graders in my after school tutoring group and recommend it to any teacher or parent seeking to spice up a reading list. As a teacher, I am thrilled to see such highly relatable text for middle schools students. I am keeping my fingers crossed that Collins follows this exceptionally well-written piece with many more. Her ability to teach young readers Greek mythology on the sly is to be envied!